A STORY CAN BE WRITTEN IN MANY WAYS . 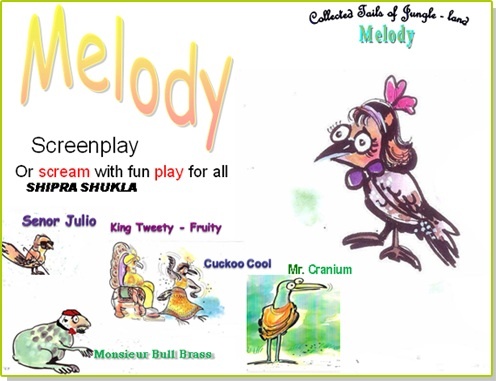 MELODY HAS BEEN WRITTEN IN FOURTEEN DIFFERENT WAYS ( 7 in English and 7 in Hindi ). 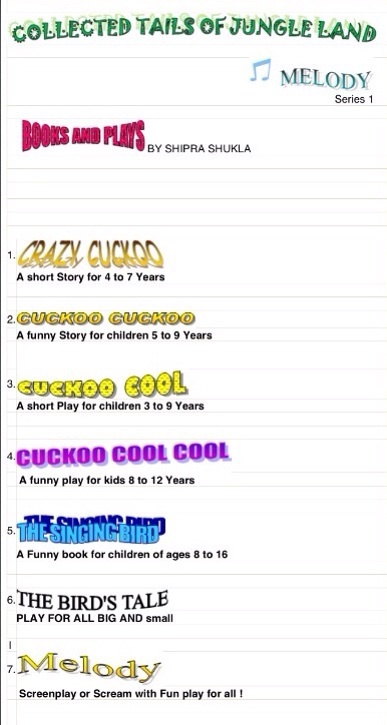 EACH BOOK CATERS TO A DIFFERENT AGE GROUP AND EACH ONE FOLLOWS A DIFFERENT STRUCTURE. THE PREMISE IS THE SAME FOR ALL, HOWEVER. 3. plays – three of them, of varying lengths for different age group; the last a satire which is suitable for adults as well. 4.screenplay – one . Can also be presented as a play for the very young . There are seven in Hindi as well . Lest you think I am masquerading the same stuff in different ways , the stories, characters , songs are different for each of the fourteen books. The characters and stories may overlap but they all follow the rules of their structure and they all read differently. You can call them avatars if you want who appear in different regions, in different ways and cater to the sensibilities of those times . Why does the cuckoo sing sadly? 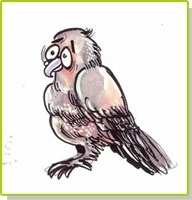 Why does the cuckoo bird tweet sadly, “cuckoo cuckoo”? 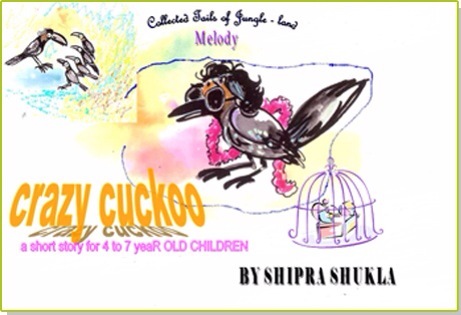 A short story about a cuckoo bird who lost it and a mother crow who never gave up and won! Oh Yes! It’s not your skin but your skill which counts in the end. 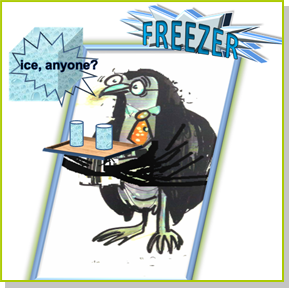 When mother crow and her team reached town they were weak with hunger and very thirsty. Mother crow could not bear to see her children in this state. And Mr. Tar-tar who was as round as a balloon was now as thin as a needle. Now Mother crow did not wait even for a second, and with her beak killed three-four rats, made them into patties and fed them to her children and Mr. Tar-Tar. 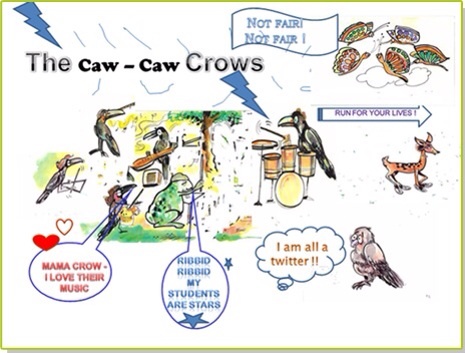 After this there was no problem for Mother Crow and her team and they began to live happily in town. Everyday they would kill a few rats and eat them up. After sometime Do-Ray, Me-Fa, So-La and Ti-Do also became expert in killing rats and the rats were running here and there in fear for their lives. They were in a real state and started talking about leaving town. When the tapes came to the shops the people of the town were very happy. 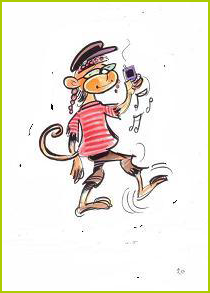 When they played the tapes at home, not only the rats but all the pests ran away frightened. Some farmers even started playing them in their fields so that the birds which eat their seeds flew away in fright. The town people were so happy with the services of the crows that they took away the golden cagefrom the cuckoo and gave it to the crows. But Mother Crow refused to live in a golden cage. She knew that a cage, whether it is made of gold or iron is still a cage and it would not allow her to fly like a free bird and she did not want that. She returned the cage to the cuckoo bird. 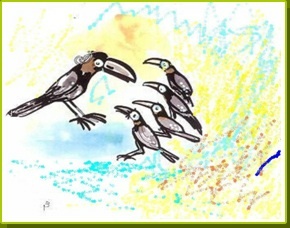 When the cuckoo bird saw Mother Crow’s behavior she was very ashamed of herself. She thought to herself this crow has worked so hard and see where she has reached and I am where I was. Mother Crow did not have beauty nor did she have any great talent. And yet her quality was useful to so many people. And that is why no one cares whether she is beautiful or not, they only praise her work. They were tears in Cuckoo’s eyes and she ran to Mother Crow’s nest. Full story and picture book elsewhere on the blog ! Enjoy ! When Margery Hatchery saw the frog puffing and puffing and looked as if he was going to burst she rushed to him and said, “Calm down Mr. Ribbid! These creatures cannot see how talented you are. We are going to leave this place and go another land where we will have the freedom to sing. 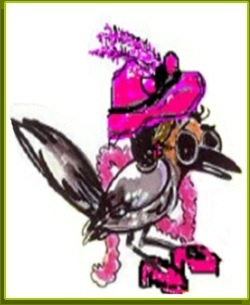 Come on lets pack our bags.” Now, Mr. Ribbid liked to live in Jungle Land. He didn’t have to work too hard for a living and there were plenty of flying bugs for him to eat. He said, “How can I leave this place. I have hopped here from a land far away and it took me a lot of time to get here. Now how can I go to another land!” Then Funny, who was the older of the two rabbits smiled and said, “Well, you can hop to the other place the same way you hopped here. 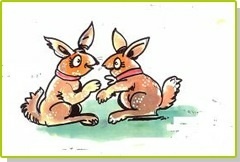 In fact, hop before you pop, Mr. Ribbid!” Funny could say some very funny things and the animals burst out laughing. This was too much for Margery Hatchery and. since Margery Hatchery was so determined. Mr. Ribbid could hear the animals laughing but he dare not open his mouth, he just puffed up and turned purple in anger and looked like a purple balloon flying in the sky. 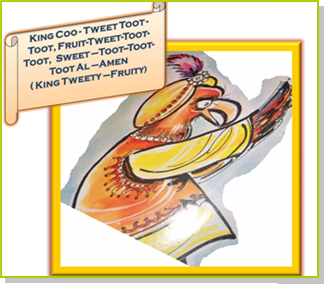 Melody, the wee cuckoo bird wins the contest in King Tweety -Fruity’s kingdom. But she really misses her mom and the animals of the jungle. Only Tweet -Fruity won’t let her go ! All the animals are engaged in various activities. The rabbits are wrestling with each other. The crows are playing cricket/baseball. The game can be imaginary. Deer, Parrot, Butterfly are also participating in the game. Monkey is giving a commentary. Mr. Bull-Frog is snoring in the corner. Bananarama : Do-Ray throws the ball and Me-Fa hits it with his bat, the ball flies ( we hear the sound of Peekaboo’s boots coming towards us) across the boundry, straight into ( Peekaboo catches the ball) Mr. Peekaboo’s hands……..
Peekaboo : Shiver my feathers ! Bananarama : Now the question is can this be called a catch ( The crows are shouting ‘catch, catch’) because Mr. Peekaboo is not a member of the team! Peekaboo throws the ball which hits Mr. Bull Frog who gets up with a start. The crows start taking out their musical instruments while all the animals start taking out their earplugs, cotton wool etc. to close their ears. A singing sound is heard approaching them. It is Senor Julio who comes on stage. Peekaboo: Who is this? ( Senor Julio bangs into him) Can’t you see? All the animals react with sympathy. Senor Julio: Does Melody live here? Margery Hatchery (Mother crow): Yes, she did live here but now she lives at King Tweety Fruity’s palace. Ever since she won the contest she has become the chief singer of his court. But who are you? Senor Julio : I am Senor Julio, I taught Melody to sing. Bananarama: Hey, you are Melody’s secret tutor! No wonder she became such a great singer. Mr. Bull Frog: So YOU gave tuition to Melody. No wonder she showed no improvement in her singing. This system of tuition has ruined our children. Tuition is bad, bad…. 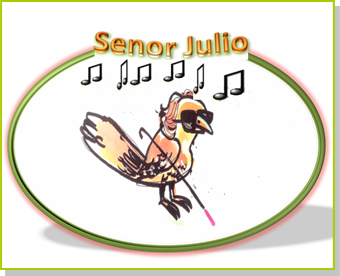 Senor Julio: I want to meet Melody. I know in my heart she is not happy. Flow-Jo: ( to Peter Parrot); People who can’t see have a strong sixth sense, they can feel things. Margery: To see Melody you will have to go far, out of this jungle to the city. Margery: Actually we have not heard from Melody for a long time, and there is no letter from her, why don’t we all go and see her. Peekaboo: ( rubbing his hands together) What a fine idea! Flow – Jo: I will come along too. All the animals: (shouting) We’ll come too! We want to see Melody! Cuckoo wants to be a star so she abandons her daughter Melody in the homely crow’s nest who, in turn, wants her brood of four, Do-ray, Me-Fa, So-La and Ti-Do, to be stars. 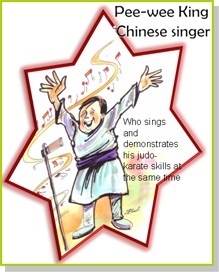 She hires Mr. Bull Frog to train her children but Mr. Bull Frog thinks Melody cannot sing. 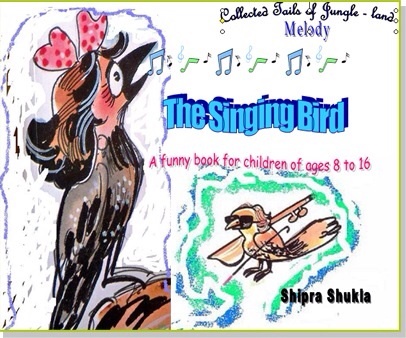 Melody wants to sing too and she seeks the help of Senor Julio, the blind thrush. A contest is announced! CHARACTERS: MELODY/SENOR JULIO/BAT VAN FRIDAY. Melody is singing as she walks in the jungle. Are the wings that make me fly. wearing a cape, he also has fangs. You are so beautiful, child. What are you doing alone in the jungle? Oh, but…. How do you know I am beautiful, you are blind. To see you don’t need eyes, a good heart is all you need,like my friend here. He, too can’t see but he takes me everywhere. Bat Van Friday at your service. He smiles showing his fangs. Yes, yes, I couldn’t have hired you otherwise. I heard you sing, you are a wonderful singer. But Mr. Bull-Frog doesn’t think so. And who is this Mr. Bull-Frog? He teaches my brothers to sing but he thinks I don’t have a good voice. Come close, my child, let me feel your throat. Beautiful but it lacks strength. Oh! How do I get strength. For strength you need training and practice. Yes, but on two conditions? You won’t tell anyone about me. All right. And the second? You can tell only one person about me, the person who is going to bring you here to learn. I don’t like to see little girls without a grown up with them. Of course, I know just who will bring me here. He’s into music too. All right then, Bat Van Friday here will drop you to the edge of the jungle and pick you and your friend early in the morning tomorrow. Senor Julio, at your service, chiquita. Adios, my child. See you tomorrow. An ambitious cuckoo abandons her gifted daughter in the homely crow’s nest, only to find out, too late, that her daughter’s talent surpasses her own. Melody, the gifted one, is one of God’s own, and her beautiful soul resonates with music and love and changes all those who come in touch with her. “We will see who dare take my place “she later ranted to her bird-in waiting as she paced up and down . “ I have a lot of tricks tucked under my wings and I will use every means, fair or foul, to crush anyone who dare come in my way! !” she screamed. Just then her attention was drawn to the Television .A nightingale was coughing and clawing her throat. Then a green vial with a sparkling green liquid appeared floating in the air towards her .She clutched at the vial and glug , glug , glug , emptied it one breath. And lo behold , the nightingale was warbling away like there was no tomorrow. A caption appeared — THE MAGIC POTION FOR SORE THROAT – FOWLIS ‘FAIR. Get your bottle today and be rid of the cat –got- your- tongue feeling evermore. Manufactured by the SINGSONG company in China. Approval awaited by the Foul Drug Administration (FDA). She called for her two spies, a chattering magpie and a thieving jackdaw. The two fluttered in. The magpie, which could not help chattering launched into a spiel right away. “Good evening Madame. What a delightful evening. We are honored to be of service to you. Kuukuu who was tapping her feet impatiently, cut her short, “Oh stop your foolish chatter, you silly bird. Listen to me both of you. “Oh no no no, that is not fair Madame. We are humble birds but we have a home and family to feed. I, myself, have seven children. There is Monday, Tuesday, Wednesday, Thursday” said Magpie. ” I can guess the names of the other three,” said Kuukuu sarcastically, ”and I am not interested in your noisy brood. Don’t give me an earache and just go and get the potion. I will instruct the treasury to give you the necessary amount. Now go, you are giving me a headache” Kuukuu said rudely. The jackdaw and the magpie turned to fly away but as was his habit the jackdaw had put away a little silver bric-a-brac in his pocket. When he reached the door the maid –in-waiting stopped him and held out her hand. The jackdaw dipped in his pocket and returned the silver ornament to her. “Force of habit” he said sourly. Then the dour Mr. Jack Dawson and the chattering magpie flew away. Kuukuu could hear Magpie chattering as she flew off and sighed deeply. “Is it my fate to be surrounded by a bunch of silly, ignorant, bird brains and thieving rascals,” she thought. It was obvious she was not aware of the phrase that you and I know that, Birds of a feather flock together. Good guys stay with good guys and bad guys find each other to hang out. 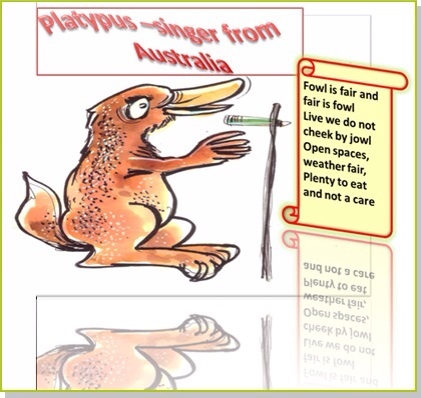 Crafty Cuckoo abandons Melody in kind Caw-Gee, the homely crow’s nest who, in turn, desperately wants her brood of four – Doray, Mefar, Sola and Tidoo, to be stars. 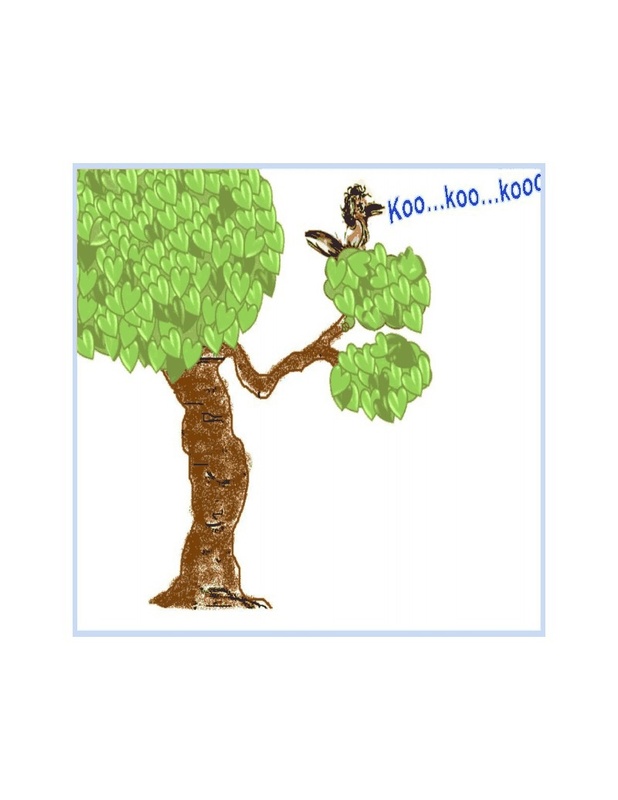 She solicits Mr. Rabid’s assistance whose booming baritone only adds to the din in the jungle much to the consternation of the creatures of Jungle-land who try to run him out of the jungle but fail in their attempts. 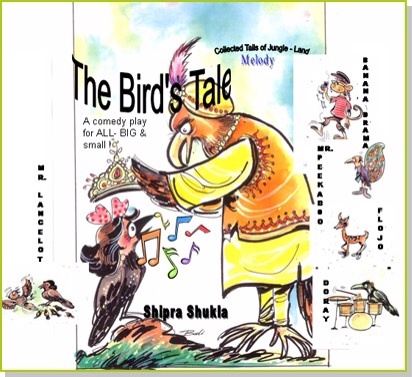 However, a contest is announced by the Kite-King where Melody and her brothers are pitted against, not only creatures from all over the world but also against Melody’s mother, Cuckoo. 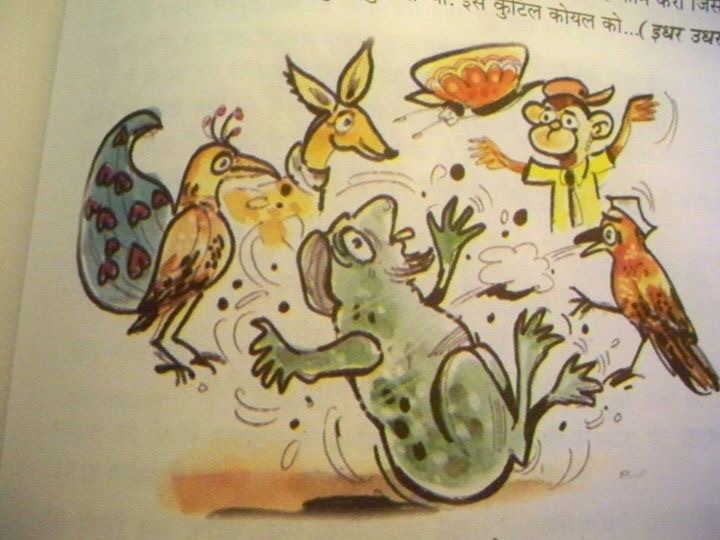 The shenanigans of Cuckoo, Mr. Rabid, Guru- Godman, the conniving crane and a host of wacky creatures, even an alien, reveal hard truths even as it take the readers on a roller-coaster ride of fun and frolic . It’s tea time and snacks for everyone. stuck in the center of each flower. For the crows there are pizzas, burgers and colas. All the creatures eat and drink. 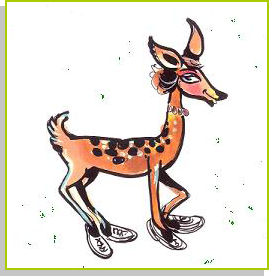 FLOW-JO (the fashion conscious deer) laughs and then tries to stifle her laughter. Mr. Rabid who had opened his mouth to say something shuts it hastily. All the butterflies nod their heads vigorously. 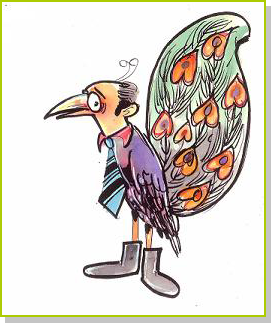 Caw- gee looks at Mr. Rabid. little hot tempered but he is very warm-hearted other wise. All the animals laugh uproariously. Mr.Rabid hops up and down, furious. “No, no, Caw-Gee, that’s not true. We are all happy for Do-ray,Me-far, So-la and Ti-do but…. Mr. Rabid’s eyes are bulging with anger and his tongue is lolling out. 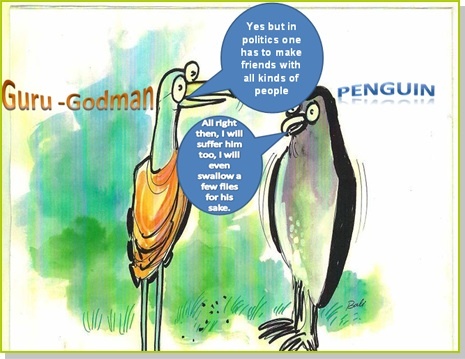 GURU- GODMAN , minister to the luxury loving KITE- KING, who shifts from leg to another to maintain the balance of power usually to benefit himself. Full screenplay available elsewhere on the blog ! 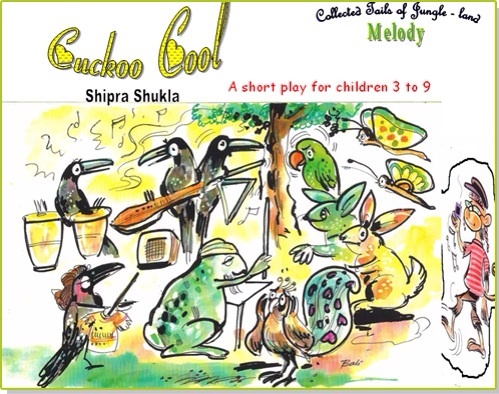 A cuckoo who wants to sing…..
Melody is born to sing but, unfortunately Monsieur Bull Brass, the frog with the VOICE, thinks she is quite of out of tune and not in sync with his pupils, the four crows, Do-ray, Me-Far, So-la, Ti-doo. 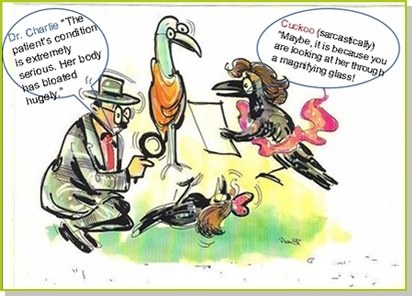 Disconsolate, Melody wanders off into the deep jungle where she meets her mentor and teacher, the blind thrush, Senor Julio, who takes her under his wings. One day Melody is pitted against her own mother who had abandoned her so that she can become a star in King Tweety -Fruity’s kingdom. Melody wins the contest but can she be happy in a golden cage ? There is huge crowd outside the venue. Flash bulbs are popping as photographers take photos of the crowd streaming in. A red carpet is laid out for the contestants. An Ostrich wearing a halter gown and chandelier ear-rings, O-Zee Van Too Die-Rich Two stands in front of the venue facing a television camera operated by the PANDA and the mike by the GIRAFFE who is so tall the mike keeps shaking and moving and appears in the frame much to the disgust of the PANDA who keeps making disgusted sounds and signaling to him frantically. An ethereal looking lark appears, on the TV screen as well. Hi, I am here for a lark. So no question of any nervousness”. She gives a tinkling laugh and sweeps away. An elephant is arriving holding a little trumpet. He lumbers off. O-Zee laughs. Four brown bears are lumbering in holding different instruments including a bag-pipe. Then she gives an exclamation. Cuckoo can be seen arriving with Stella hovering in the background. We see the CAW-BAND and Monsieur Bull-Brass puffed up with importance standing. She turns away. 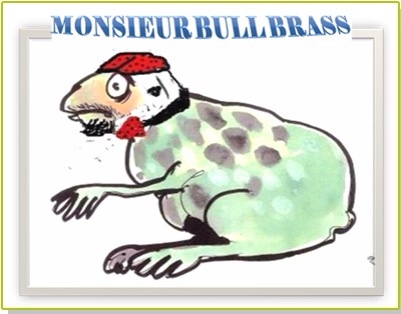 Monsieur Bull Brass deflates. The PANDA lowers the camera and crooks his finger to the giraffe who has been holding the mike in the frame intermittently. The PANDA is seething. The PANDA is trying to pull the mike from the giraffe who is resisting. There is a sound of engine revving and Bat Van Friday zooms off. Hello folks, I bet you are wondering where this dog diva has vanished. I have been away for a bit. No, not on a vacation unfortunately. I just had a massive writer’s block which just means I didn’t know what to write. I kept wondering what brings on this situation which is particular to dogs and writers or dog writers. And then I realised it was brought on by disturbance and that caused me stress. I was going round and round chasing my own tail. Then I thought what was it that was causing this condition ? Could it be my diet ? I am eating dog food only and that is not a happy situation for a dog who has had a taste of human food once. They just can’t go back. But then, it’s not up to us , is it ? Is it the environment ? I have been at the receiving end of a lot of unwanted attention recently. When it comes to company, I am very choosy. I like human company or dogs who are more human than dog which means they have to be civilized and well mannered and not boisterous. So that’s it. I have found the root of my disturbed state. It is Toby. He has become a frequent visitor and he is making me uncomfortable. He is just not my type. To add to my woes he has been slurping water from my bowl and crunching food from my plate without so much as by your leave. Okay, now that I have got to the root of my stress I am going to do something about it. Wait for my next post about ” Bella plans to get rid of Toby.” If you have read the story, “All about cats” where Bella was saved from the machinations of a wily cat by divine intervention then you know it’s not in a DOG’S hand/paw to save herself but in a DOG spelt backwards hand to help this dog ! BELLA’S ANGST RIDDEN TIRADE ! Now coming back to the subject of ‘whether pigs have wings ‘ is the related one about sausages. It’s Fourth of July and Barbecue day where sausages are floating around right in front of my eyes. But the question is, are all those floating sausages held by various humans of all shapes and sizes going to find their way into my mouth ? I have noticed when it comes to food the human kind are not very kind . I see them chomping away on various delicacies with nary a thought of their lord ( in this case lady aka moi ) and master waiting in the wings for a tidbit. And, if we are denied this delicacy why do you even call it hot dog ! If that is the case then please look at yourself , humans . Why are you eating all that red meat ! And slathering those buns with butter and chugging down huge amounts of soda and topping it off with that brown looking sweet thing with that cold even sweeter mess on top ? ( Bella’s talking about Brownies with vanilla bean ice cream ) . This is hypocrisy carried to the extreme. But, I am not going to make an issue about it. After all its Independence Day and you are free to do what you want, even stuff your faces till you are ready to burst. Just don’t forget the dog waiting in the wings for her share of goodies too . Photo by AMBIKA , the assistant who is the best tummy rubber, ball thrower, AND now the best dog 🐶 photographer ! Kudos kid !